What is the biggest threat to the Airsoft Community? Government Policy: With the General Election just around the corner, who our next Government will be determines our future. As a lot of you will know, The Green Party, if they are elected (which I know a lot of people think is a ridiculous notion but what is more ridiculous is underestimating a Political Party that has garnered so much support in such a short space of time) want the sale and manufacture of Realistic Imitation Firearms to be banned which means we would have to swap our beloved guns for clear plastic replicas or brightly coloured ones (check their manifesto!) You would have to prise my Black Rose from my cold dead hands before I handed it over haha! This would have an exponential impact on our sport. I have emailed The Green Party myself to ask if an accommodation would be made for our sport and got the answer 'if you join our party as a member you will have a say on this policy', obviously I cannot support a party that proposes such a policy, so their suggestion is a no. Would this really stop us airsofting though? Would criminalising the ownership of RIFs stop us? The loss of businesses, jobs etc would be vast and would more than likely push airsoft underground. The misuse of RIFS: One thing that has been prevalent in the media is the misuse of Realistic Imitation Firearms, and this is also something that fuels the policy above. You see it in the news, minors playing with RIFs in public, adults walking around in full gear in town centres with an airsoft weapon and scaring the general public. To anyone off the skirmish field, it is a live firearm. It goes without saying, using them for anything other than their intended use at dedicated sites or on private property is a incredibly dangerous practice and has a huge impact on how the media and those outside of our sport view us. Here is the link to the article in the Mirror regarding the man dressed in full combat clothing carrying a rifle - http://www.mirror.co.uk/news/uk-news/norwich-gunman-hunt-live-updates-5326181 although it was later found out that he was raising money for charity, walking around a town centre with a RIF on display without informing the Police or having any evidence to support that story, is an incredibly risky move. Also in February this year, a 17 year old boy was sentenced to community service for shooting an Airsoft Sniper out of his window at Pupils in a Primary School (http://www.bbc.co.uk/news/uk-scotland-edinburgh-east-fife-31438010), according to the article the young lad was blowing off steam but shooting Primary school children? Incredibly mean and stupid in my opinion. Go to the range, shoot some paper targets, not live people and animals! It goes without saying, please do not do this! Airsofters: This one may come as a surprise to many of you, but one of the biggest threats to our sport is Airsofters themselves. Now I'm talking about a specific type of Airsofter, you will have seen them - the ones that troll public forums and drag our sport through the dirt by using racial and homophobic slurs, the sexists, those who insist on being obnoxious to newcomers etc. As a niche sport, that is often misunderstood, we need to look after each other - by helping new players, practicing proper gun safety etc. Banter is all well and good, memes have their place but being abusive and purposely obnoxious to other players over the internet is a sure fire way to ensure people see us as immature and irresponsible. In my opinion, this is the biggest threat to us. You hear stories of people illegally purchasing RIFs, carrying RIFs to sites uncovered and in view of the public, fights breaking out at skirmish sites, calling each other names, starting hate campaigns against members of our community and it needs to stop. One of these we don't have much control over, Political parties will always have policies in their manifesto that rain on someone's parade but the other two threats can be prevented by us! This article isn't meant to sound preachy, I just love this sport and I want to protect it as best as I can. The friends I have made and opportunities that have arisen from this sport are incredible and I am loathe to see them go. Be kind to each other, treat others how you would like to be treated, be a decent human being! If what you have to say isn't necessary, positive, constructive or kind, just think, is it worth it? We need to look after each other if we want our sport to become as big and as great as it can be! Thoughts? Leave them in the comment section below! 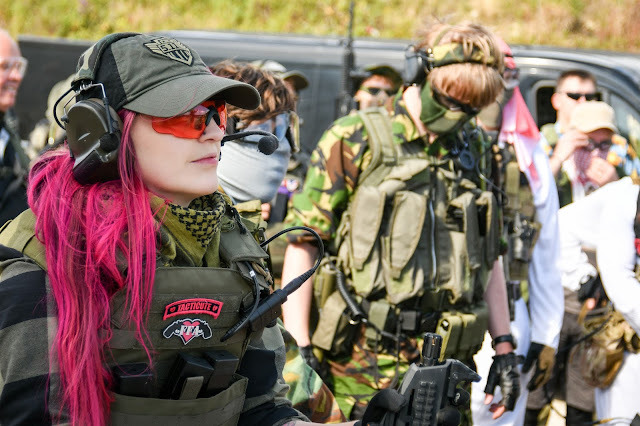 Why do we play Airsoft? Black Hawk Down Filmsim Bloopers Upload!